Pours amber with a one finger beige head. The aroma is not very strong, but there is some citrus and tropical fruit, and some caramel malt. Has a mostly bitter taste, balanced by some sweetness. There is citrus zest, white grapefruit, some tropical fruit, and caramel malt. More bitter than I thought it would be. Medium bodied with moderate carbonation. Oily and resinous hops with a dry finish, and a bitter aftertaste. This beer didn't do much for me. 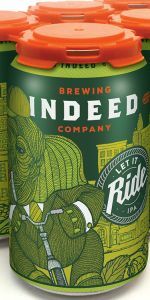 Indeed Let it Ride IPA has a thick, cream-colored head, a clear, copper appearance, with a few stray bubbles, and heavy lacing left on the glass. The aroma is of strong hop oil, tropical fruit, and bread. Taste is of those elements, with rye and very strong and pleasant bitterness. Mouthfeel is high medium and slick, and Indeed Let it Ride IPA finishes puckering and drinkable (for those used to bitter).